← 2013, What will be your reality? Note: If the pictures are small, try hitting F5 at the top of your keyboard. Steve Williamson, Pres. 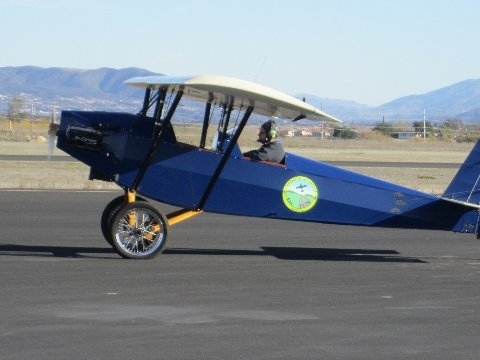 of EAA chapter 1279 in French valley CA wrote to say that their multi-year Pietenpol project had flown. This is a very important milestone and an outstanding effort that his chapter can be very proud of. It is a little publicized statistic that less than 10% of Chapter projects are ever finished. The flight of this plane is a serious tribute to Steve and all of his chapter members. It is physical proof that they have outstanding spirit, skills and persistence. Hats off to the whole crew. Above, the Piet out on the French valley ramp. 1279 wisely brought in a very experienced Piet pilot for the first flights. There is nothing unusual about the Piet, but I have a lot of respect for a person who chooses to put the most qualified pilot in the plane for the first flight, rather than the typical ‘I built it, I fly it’ mentality. The first flight went as planned, no surprises. I am happy to report to all of you who have been following progress on the Pietenpol Air Camper project being built at the French Valley Airport by members of EAA Chapter 1279 that the airplane has made its maiden flight. On Saturday, January 5, 2013, long-time Pietenpol owner and pilot Scott Liefield made the trip from his home in Lancaster, California to the French Valley Airport near Temecula, California to do the honors (see photos below). Construction on the airplane was completed in October. DAR John Shablow performed the final inspection on Saturday, October 29, 2012. As part of his inspection, John performed a formal weight and balance calculation before issuing the Certificate of Airworthiness. With all of the paperwork completed and the C of A in hand, the first flight was scheduled for Sunday, November 11. Unfortunately, an engine problem developed which delayed the first flight for a couple of months while we made the appropriate repairs. By the first of the year everyone was satisfied that the airplane was ready to go. Scott and his father arrived early Saturday morning. We all did a thorough inspection of the airframe, making careful notes of anything that needed attention. With the engine cowling in place, we tied the tail down and started the engine. We warmed up the engine before running it up to full throttle for a full two minutes. It ran smoothly and all of the gauges were within normal operational limits. After a brief cockpit check, Scott climbed in, taxied the airplane onto the active runway, and took off. Staying within a mile or so of the field, Scott climbed to three thousand feet and checked the flying characteristics of the airplane. He later reported having to hold in some left rudder during the entire flight. This he thought could be eliminated by offsetting the leading edge of the vertical fin by a half inch. The airplane topped out at 88 miles per hour at full throttle in level flight with the engine turning 3,000 RPM. Scott said that stalls in the airplane were straight ahead with no tendency to fall off on a wing. It recovered normally with simple release of the back pressure. After 30 minutes in the air, Scott returned and made, by his own account, one of his best landings in a long time. A perfect ending to a momentous event. For those of us involved in the building process, it was a moment that brought smiles, hand shakes, and high fives all around. To those of you who have been following our progress through these regular updates or through our chapter website, we thank you for your interest and your encouragement. Now we begin a new chapter in the history of Pietenpol Air Camper N1279Z. The airplane will continue to be based at French Valley and will forever be associated with EAA Chapter 1279. It is our hope that wherever we go with the airplane, it will provide inspiration to others pursuing their own dreams of building and flying their own airplane. Blue skies! What kind of support do we offer our builders? This question comes up from time to time when people on the internet who are not yet builders comment that I don’t return email questions in an hour, and they got our answering machine when they called. The 1279 Piet is a good illustration of the difference between companies that offer consumer mentality instant gratification of quick email, and ourselves who are focused on real builder support where it is effective, in-depth, and aimed at getting people safely flying. I personally find the later a more valid goal. If you are new to homebuilding, read these notes to understand what real support is. Steve was invited by the EAA to put on an indoor display on the project all week at Oshkosh 2010. His presentation was extremely well received. I stood in the back of the last one with the EAA’s Director of Homebuilding, Joe Norris. At the end of his presentation, I gave Steve a special present: the cast aluminum valve covers that flew on our own Pietenpol years ago. He was moved. While I had previously seen 50 chapter projects that were bound for oblivion, it was easy to see that Steve and his crew had what it took to finish and fly their plane. Later in 2010, when I was in northern California for Corvair College #18, I made sure I reserved time to travel all the way to the southern end of the state, and I personally came out to inspect their project for a few hours, and meet with members of 1279 that I didn’t make it to Brodhead. Again, I think of this as effective support, not the appearance of it. As Steve’s letter explains, they had an engine issue on ground testing. In all of our manuals, I specifically state that the plane is to be tied down and run at full power for 2 minutes without any type of compromise. When the 1279 guys did this, their engine lost power, and they were quick to investigate. They sent me photos which revealed that a poorly done spark plug helicoil was hanging in the combustion chamber and acting as a glow plug and tripping off detonation. With the assistance of West Coast 601/Corvair builder and pilot Ken Smith, the issue was quickly and inexpensively resolved. Steve later wrote me a letter thanking me for the flight ops manual that gave detail information on first flights and the two-minute test. He directly credited this information with preventing a disaster on the first flight. He said the plane ran well before the two-minute test, and without it, the first flight would have likely ended very poorly. Again, this is the kind of support we are focused on providing. Again, if there is any other alternative engine guy out there offering this kind of support, send me his name, I’d like to meet him. We would get along great. In reality, most companies don’t make house calls because there is nothing in it for them. They already have your money, they are moving on to the next sale. Most of them would be just fine if your plane was never finished or flown, their legal departments know that this is the best liability position for them. Think I’m kidding about this? Hang out very late at night at Oshkosh with me and I will take you to the bars where only the industry people go. Pull up a bar stool next to the polo shirt clad reps on their tenth beer and you can hear this type of commentary yourself. These people still rub elbows with me because I write entertaining stories like “Unicorns vs Ponies” and because they know I can write exposing things about our industry all day long and it isn’t going to change the fact that 95% of the people arriving in experimental aviation are pure consumer mentality, and have little or no interest in becoming an aviator, through the traditional Learn Build and Fly passage. I recently purchased an Air Camper with the A65, had it ferried to me and cannot find the W&B. In your experience, with the Piets , is the leading edge of the wing the datum and 15″ – 20″ CG limits. Also need to find Piet clubs or groups in Tx. Thanks for any info.